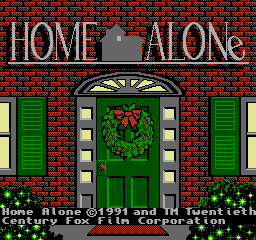 Home Alone (the movie) is a heartwarming tale of a boy who is forgotten by his parents and then screws with the burglars who break into his house. 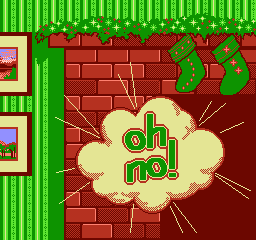 The video game adaptation for NES is pretty much like that too, since receiving this horrible game could only be a result of your parents not loving you. The screwing with burglars part comes in the game itself. As a kid, I didn't really catch most of the jokes in the Home Alone movies; all I cared about were the pranks and traps that Kevin set for the Wet Bandits, which were usually elaborate and cringe-tastically brutal. You'd think that a video game that took this most violent and exciting part from the movies would be at least a little bit fun... but it's not. Instead of elaborate traps, all you need to do is pick up an object with one button and put it down with another button. Having done so, you will have successfully laid a trap. There's no way of being creative with these traps, as they are all just squares with different icons inside them. Some of the traps that you can put down are recognizable from the movie, but it's hard to tell what others even are or how they would be helpful. I recognize the tarantula, but what's a light bulb going to do for me? Actually having Harry and Marv fall into your carefully laid traps is equally unsatisfying. No matter what the trap is, if they touch it, they fall down in a heap and are stunned for a short time. That green tank with the three dots above it is Marv after being hit with a tarantula. The green tank on the right, I mean. The green stuff on the left is bushes. The game laboriously continues until you are captured or until you survive for twenty minutes. That's right, if you're good, you can finish the whole game in twenty minutes. 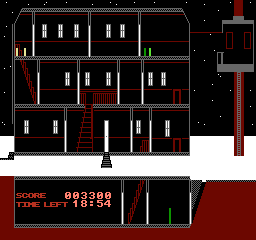 But not just any twenty minutes, these twenty minutes will be spent running around the same one level, because the entire game takes place in the McCallisters' three story house, its basement, and the tree fort in the yard. Interestingly, the tree fort, basement, and house interior each have their own music tracks, which is better than only one music track I guess. Here's the map, with Atari-style bars representing each character and trap. Apart from laying traps, you're also able to evade capture by hiding in certain background objects. This method is fairly unreliable and you'll probably only use it as a last ditch effort to escape, but it's perhaps the coolest thing to do in the game. Not knowing whether your hiding spot will actually work is kind of like playing Amnesia, except that Amnesia is actually well designed. In Home Alone, you don't really know how long a trap will stun the bad guys, whether or not hiding will work, where the burglars are at any given time, or whether you're standing in just the right spot necessary to climb the stairs. For how meager the content in this game is, you'd think that it would at least be well-polished, but it's really not. In fact, your best bet for winning the game is to find a loop to get the enemy AI stuck in, so you can just do the same thing over and over until the twenty minutes are up. This game is bad. Really bad. It's even worse than it looks in this review. The explorable area is small and the gameplay is unsatisfying and awkward. It probably would have been more fun as a multiplayer game of tag or hide and seek, though I don't know how that would have worked on NES. As it is, even if you do manage to help Kevin protect his home from the burglars, if you paid money for this piece of crap game, you're the one who got robbed. Why do I own this GBA racing wheel?